Dr. Muir and Dr. Rose are key opinion leaders in the area of endocrinology, and they have created a state-of-the-art issue for neonatologists. The clinical reviews will prepare perinatologists and neonatologists for the challenges in clinical endocrinology that arise in fetuses and newborns. More specifically, authors will provide updates on the biological basis of disorders in order to illustrate the rationale for diagnostic approaches and current therapies and to provide readers with a basis to consider and evaluate new clinical offerings. 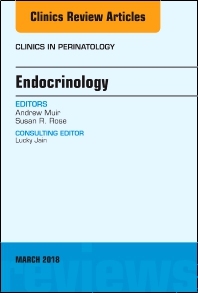 Articles on the following topics are included in the issue: Congenital hypothyroidism; Thyroid function in the NICU; Neonatal thyrotoxicosis; Neonatal diabetes; Hypersinsulinism; Hypopituitarism; Glucocorticoid use in the NICU/ neonatal adrenal function; Adrenal insufficiency, CAH, Prenatal treatment of CAH; Neonatal Cushing Disease/Congenital endocrine tumors; Early ID of Turner Syndrome/Preserving fertility; and Bone mineral/ Calcium disorders in the neonate.